Well, we did it. We made it to the last month of the year. As we consume and digest this December issue of Cleaner & Launderer, we are weeks, maybe even days away from finishing 2018. Hopefully, we can all honestly say that we gave our best effort in every area of our lives this year and are ending the year strong. Back in January some of us set goals and made resolutions. So how did it go? (Don’t answer that out loud. Just take a quiet self-inventory for your benefit). Did you finish what you started? It’s a fair question and one that deserves an honest answer. There’s nothing wrong with a little self-accountability. If you can’t hold yourself accountable, who is going to keep your employees accountable? They’re not going to do it, are they? Of course not. As a business owner, ultimately that’s your job. In case you missed the big question earlier, here it goes again. Did you finish what you started? Are you close to achieving the goals you set at the beginning of the year? Were you consistent throughout the year so that you set yourself up nicely to end 2018 on a high note? Did you get it done whatever it is? 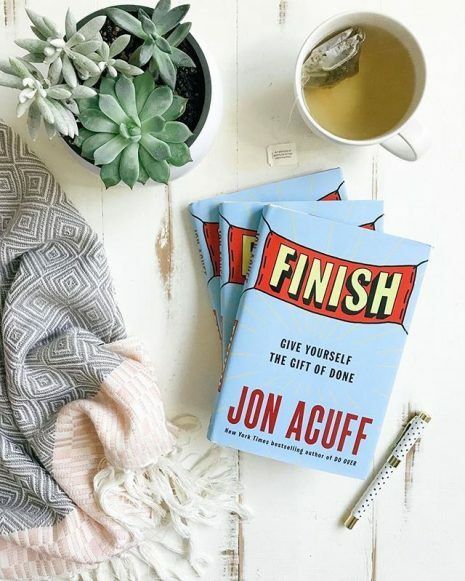 In Finish: Give Yourself the Gift of Done, Acuff presents seven tips for silencing perfectionism and beating the “always starting, never finishing” trap. 1. Cut Your Goal in Half: Acuff claims that attaining a smaller goal motivates us to do it again and also increases the likelihood of repeating it by a whopping 63%. (I don’t know about you, but I like those odds). 2. Choose What to Bomb: The author argues that perfectionism is a lie that wrongfully tells us that we can be great at everything. Instead, he believes that we should pick which things we will knowingly neglect in order to reach our goal (such as household chores and yard work or keeping up with the latest hit television programs). 3. Make it Fun if You Want it Done: “Set mini-milestones along the way to reaching your goal and reward yourself every time you surpass them.” Acuff’s research claims that we are 46% more likely to reach a goal if we actually enjoy it. 6. Get Rid of Secret Rules: It’s nonsense to tell ourselves, “If it’s easy it doesn’t count,” writes Acuff. He states that it is this type of flawed logic that makes people who hate running think that it is the only “real exercise” they can do. Acuff says that silencing these types of ridiculous ideas eliminates self-sabotage and improves the likelihood of success. Jon Acuff possesses a unique blend of inspiration, sage wisdom, insight and self-deprecating humor that makes his latest offering a must-read for anyone who’s tired of being a chronic starter and wants to become a consistent finisher. If you’re going to “give yourself the gift of done,” I highly recommend adding Finish to your list of must-read books for 2019.